I read with interest on the negative feedback about granting domestic helper one off day per week. It brought me to think about the period when my maternal grandmother was bedridden for a few years. During those days, unless you are rich enough to have servants, having domestic helpers were unheard of. To ease the burden of my 2nd aunt who was living with my granny then. All my aunties and my mom chipped in, taking turns to look after granny. It was a tough job I won't deny it but somehow people managed. Thanks to our wonderful policy back then, these days, majority of the household have an average of two kids. I can't help to wonder what will become of me when I become old and immobile. The burden of my two kids looking after me can be quite taxing as there are only two to rotate unlike my mom's time whereby she has got three sisters to help out. I also begin to wonder having domestic helpers actually created little emperors and empresses for our next generation as well. Take for example my son, he took it for granted that my helper will pick after him. Thus he has got no sense of responsibility that he needs to bring his dirty clothes to the laundry basket instead of throwing them around the house. (yes, he can leave his dirty socks in the study, his dirty school shirt in the hall and his school pants in his room). We do not condone to such behaviours. We actually told my helper not to pick after him. Having said that, in our helper’s mind, it is her responsibility to keep the house tidy. With the situation getting bad, now my helper fully understood that the more she picked after him, the more he will be become irresponsible. So finally our message is driven across. Personally I have no issue with helper’s getting day off. My only concern is how she utilised her time and will she be mature enough to ward off bad influence. Having our bond forfeited 50% if the helper goes missing is simply ridiculous. If the government wants to implement this rule, then make it less accountable for the employee. Why should be we be held responsible for someone’s decision? In this sense, I think we are not giving a fair deal. It is okay to compare with neighbouring countries but do it whole heartedly. They don't have levy like ours. The monthly levy we give to the government, what has the government done for us? So who is protecting us? Hahha… I am getting annoying with all my rambling don’t I? Let's talk about happy stuff. I actually glazed some chestnut sometime back, hoping to attempt Mont Blanc. As usual, my slow delay tactic won. 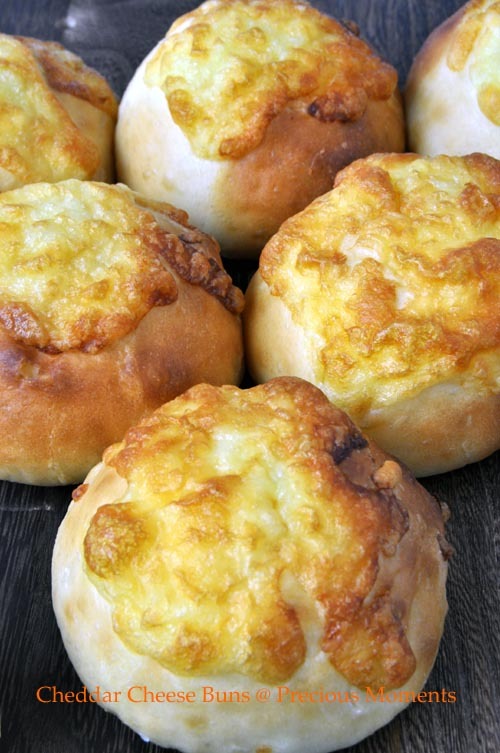 Yesterday I attempt Daily Delicious’s Cheddar Cheese Buns. So today, I decided to bake a cake instead. By now you might have noticed, my cakes are all in a loaf pan that is because I already packed most of my cake tins! LOLz. 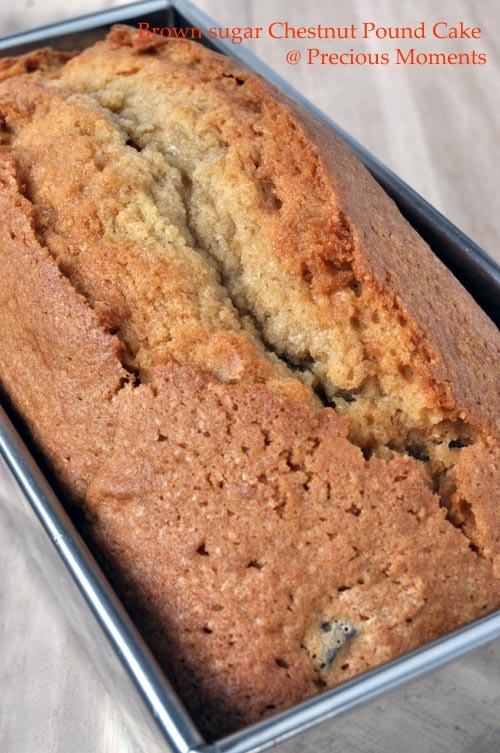 This time round, I chose Brown Sugar Chestnut Pound Cake from Daily Delicious again. I am sure the reason is obvious. I have Chestnut in the fridge! Also I find that this baking method is totally new to me. Texture wise, it yields a really fine crumbs. The fragrant of the brown sugar gives this loaf a total new dimension. I suspect I over baked it for I "squeeze" my batter into a small tin thus resulting for it to bake longer than indicated. I will definitely attempt this again! Place the baking paper in to the loaf tin. Mix about 1-2tbsp of flour mixture into the chopped chestnut. Set aside. Beat the butter and brown sugar until light and fluffy, add the egg yolks into the batter and beat until combine. Beat egg whites until foamy, add the sugar, salt and whip until stiff peaks form. Fold 1/3 of the meringue into the batter, fold half of the flour mixture, follow by 1/3 of the meringue, the rest of the flour and chestnut. Fold the rest of the meringue to combine. Put the batter into the tin. Bake for 15 minutes, then lower the heat to 160 °C and bake for another 30-40 minutes or until the toothpick insert into the center of the cake come out clean. I do not have a domestic helper, have heard lots of pros and cons. Sometimes we have no choice, we need them to look after the elderly as most of us are working. Days off is really an issue. And thank you for stopping by my garden, it is in a state of mess now! Most of my plants has died due to the heat, I need to replant and organize again! Edith, I can relate to what you feel as a mother. My son grow up with maid beside him (he is coming to 4 years old). He kept asking me why we don't have maid now, he wants someone to play with him, helping him tidy the toys, etc. After nearly 2 months without maid, I'm surprise by how helpful he is, he feed himself, make sure he didn't drop the food on the floor, tidy his own table before meal. I say child can learn very fast, they need to know there isn't anyone to help them then they will do it. Hi kitchen flavours, I do understand the situation, in Singapore having two kids policy in the past added more pressure on the next generation. Unlike my mom's time, there are siblings to help out. Thus helper become the extended arm for such situation. Now I juz hope that there will not be more social issues of unwanted pregnancies. Oh what a pity, I hope you restore them soon. Love looking at yr garden. Ah tze, I was maid less for a gd 5 years. It was gd coz kids will help out.. Due to a slipped disc, I needed extra help . If I can do without, I rather not have one. So that everyone can learn responsibility esp my kids.